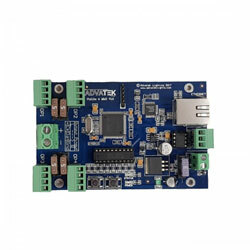 The PixLite 4 MkII ECO controller supports input protocols via an Ethernet connection and displays RGB color lighting on supported pixel IC types. It is designed to control half as many pixels as the PixLite 16 MkII ECO controller using 4 physical outputs (instead of 16). The smaller form factor gives you another level of flexibility in your pixel projects. It is also shipping with the capability of simulataneously outputting a DMX512 universe (acting as a single E1.31 to DMX512 bridge, no Art-Net to DMX)in additionto the 16 universes of pixel output. -Art-net It can handle up to 16 universes of Multicast/Unicast E1.31 or Art-net data and controls up to 680 nodes per individual output. Outputs to the following IC types: TLS3001, SM16716, LPD6803, WS2801, WS2811/12/12B/13/18, APA102/104, TM180x, MBI6020, INK1003, APA102, SK6812, UCS1903, MY9221, MY9231. Note: one pixel type at a time per controller. The controller also interfaces with our GUI utility for easy configuration and uploading of new firmware. This controller can output up to 7.5A per output, but is supplied with 5A mini blade fuses by default. You can change the fuses to any value up to 7.5A to suit your application.